Today as we stand safe and free, clothed with the privileges and rights of free citizens, we give thanks and remember the ANZACS who gave so much. We also remember those students and staff who once attended Bendigo High School and who sacrificed their lives for our freedom. We give thanks, we honour them and we will not forget. 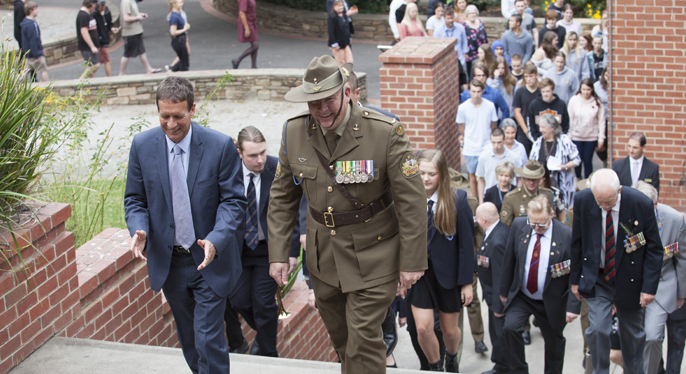 It is a tradition of the college that each year the student body walks up the memorial steps as a gesture of respect in commemoration of the fallen, during the College ANZAC Day Ceremony. 1947 – Plans were under way for a terraced entrance to the new building as the school’s war memorial. 1956 – The building of the Memorial Steps was begun. 1957 – The Memorial Steps were completed and a simple ceremony officially opened the memorial to “those members of the school who served and suffered that our way of life might be preserved”. It was proposed that on the first day of each school year, all pupils would enter through the gates and ascend the steps in memory of, and gratitude to, those who are commemorated. And so, for all new pupils for two decades, their first memory of the “School on the Hill” was that solemn procession up the steps. It was also symbolic of the ascent to higher learning and an immediate initiation into the traditions of a great school. 2001 – There was a desire to value the college’s history and traditions with the re-instatement of the college’s tradition of commemorating ANZAC Day. Students conducted the ceremony and used poetry, music and dance to convey aspects of war and its legacy. Past students who had served in the defence forces were also invited.